Photographer Ben Garvin has joined me in western North Dakota. And what a difference it makes. 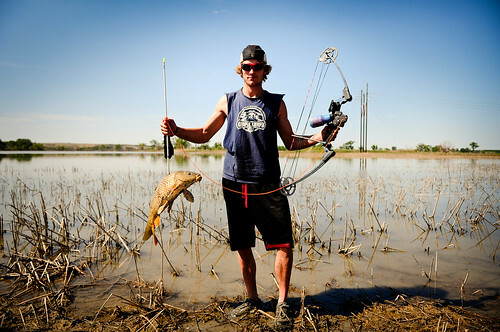 During our first day together, we spotted a guy bow fishing in the Missouri River. We pulled over, chatted with him and discovered that he’d just finished his oil patch shift. Instead of curling up at home with a video game, Benjamin Audet grabbed his bow and arrow and headed to the water. He’d been awake for 24 hours in a row, or maybe 36 hours, he wasn’t sure. His gig, like many oil jobs, isn’t on a rig, but does require long hours. On the night before we met, he worked from 6 p.m. to 6 a.m.
Now the sun was rising in the sky and Audet was pointing his arrow into the murky Missouri at flashes of carp he saw fluttering in the water. His New Jersey Devils cap was backwards on his head and his running shoes were drenched with mud. But he didn’t seem to care. And then it did. A carp swam too close, Audet aimed, fired and impaled his nemesis. Then Garvin stepped in to capture an image of man and fish.